Looking to score the big bucks? A new report finds that the best paying jobs in America are concentrated in health care, technology, and law. Physicians have the highest median base salary, coming in at $187,876, according to the report from career website Glassdoor Inc. The second-highest salary went to pharmacy managers, a gig which requires both a pharmaceutical degree and management experience; patent attorney came in third. The report focused on U.S.-based employees and analyzed salaries that Glassdoor users entered on the site from February 2016 to January 2017. Only job titles with more than 100 salaries reported were considered for the study. Of the 25 jobs best-paying jobs, 11 are in the tech industry, many in engineering. Silicon Valley is known for paying particularly well, with some first-year engineers in the area landing offers above $200,000, considering their salary together with cash and stock bonuses, according to a separate report. That may not be quite as lucrative as it sounds: The median monthly rent for a one-bedroom apartment in the Bay Area exceeds $3,000 a month. 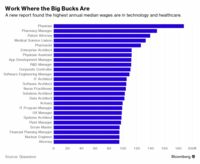 Health-care jobs are also getting more lucrative: Last year, Glassdoor's list included three jobs in the field; this year's has six. Nurse practitioner comes in at 14th place, with a median annual salary of $104,144 and physician assistant landed seventh, at $112,529. At the bottom of this list were two jobs known to pay well: nuclear engineer and attorney. While working on nukes might seem exciting, Glassdoor's website found only 155 job openings in this space, compared to more than 13,500 available roles for physician assistants. The median annual earnings of a nuclear engineer, $94,852, are about half those of a doctor.